LinkSafe by Will Strafach (creator of the Chronic Dev Team) has just been made available on Cydia, through the BigBoss repository, for $0.99. What this tweak does, is alert you when tapping on certain links to make sure whether you would like to proceed or not (e.g. 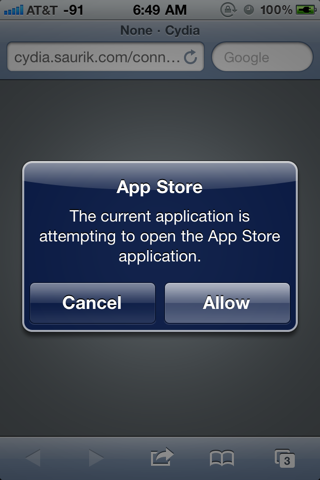 if it opens another application). This is especially useful for those who abhor the native YouTube application (such as myself, I can’t stand it) and would like to be informed when MobileSafari or Twitter for iPhone spends the next four minutes jumping around and finally loading a video on YouTube.app. It’s available now from the BigBoss repo for only $0.99! Pick it up today; it’s definitely useful!